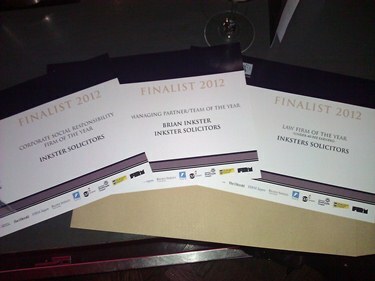 Inksters have been nominated for three awards at the Law Awards of Scotland 2012. The nominations were announced tonight at an exclusive reception held in Glasgow. This award nomination recognises Inksters achievements over the past year including opening a new office in Inverness, expanding their crofting law business throughout the Highlands & Islands, increasing the number of employees, moving all IT systems to the cloud and rebranding. Brian Inkster has been nominated for this award as a result of his management of Inksters growth over the past year which has seen the developments already mentioned for which Inksters have been nominated for Law Firm of the Year (under 40 fee earners). This nomination also acknowledges Brian's blogs on practice management issues via The Time Blawg and the demand for him to speak on law firm IT matters at Conferences. Inksters support of the Barnardo's Free Will Scheme is marked by this nomination. This included Inksters setting up a pop up wills kiosk in a Barnardo's shop in Glasgow during Remember a Charity Week. This project builds upon the Inksters Give philosophy which began in 2009 with the Habitat for Humanity Global Village Challenge in Argentina. Brian Inkster said "I am delighted by this recognition of the achievements made at Inksters over the past year. In what remains difficult conditions for any business we have opened a new office in Inverness, increased staff numbers, enhanced our technology, rebranded and continued to support charitable causes. Inksters has been going from strength to strength and we have a lot more developments planned for the forthcoming year." The winners of the Law Awards of Scotland 2012 will be announced at a ceremony to be held in the Radisson Blu Hotel in Glasgow on 13 September 2012.